Definition of NAICS Code 812191: This U.S. industry comprises establishments primarily engaged in providing nonmedical services to assist clients in attaining or maintaining a desired weight. The sale of weight reduction products, such as food supplements, may be an integral component of the program. These services typically include individual or group counseling, menu and exercise planning, and weight and body measurement monitoring. You can also download your own copy of the complete 2017 NAICS Classification Manual. The NAICS Manual is updated every five years. The 2017 copy will be applicable until a new edition is produced in 2022. What codes are similar to this classification that might be a more applicable code? The cross-reference guide below displays the codes for other similar industries. Please review to find the most applicable classification. Providing medical or surgical weight reduction–are classified in Sector 62, Health Care and Social Assistance. 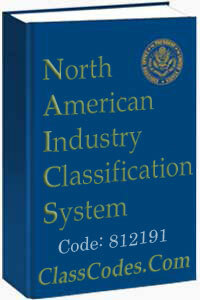 The North American Industry Classification System contains multiple index entries that are each descriptive of the same code. The bulleted list below shows all applicable index entries (Current and former) that are associated with this classification. These index entries further elaborate on the scope of applicable industries that have already been defined at the top of this page. Looking for an insurance classification other than the North American Industry Classification System? If a company falls within the industry defined on this page, then the class codes mentioned below may be applicable. Please note that the bulleted cross-reference guide below is not authoritative. Users should have an insurance professional review to ensure proper insurance classification. Resources: Praxiom, AceGroup, TDI, California Division of Workers Compensation, Delaware Workers Compensation Manual, Pennsylvania Workers Compensation Manual, Michigan Workers’ Compensation Placement Facility: Classification Definitions, New Jersey Workers Compensation and Employers Liability Insurance Manual, New York Workers Compensation and Employers Liability, North American Industry Classification System, Florida Underwriting Guide: Commercial General Liability Classifications, Standard Industrial Classifications. The suggested cross reference guide for NAICS code 812191 is based on our research using the resources cited above. NAICS codes are broken down by digit. The broadest description starts with the 2 digit sector codes. The 3 digit subsector codes are more specific, then the 4 digit industry group, 5 digit industry, and the most specific is the 6 digit NAICS code (Where you are now). If the code on this page does not describe the industry of the business in question, then select the largest applicable code below. From there, follow through the progression of smaller digits to the larger digits in order to obtain the most specific 6 digit classification.